Brian Adams of Simon Says came to HQ today to collect the presents that CAS staff had bought for the children that Simon Says help get through Christmas. 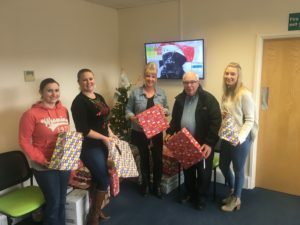 Instead of doing the normal “Secret Santa”, everyone agreed to donate the money to presents that will help some of the bereaved boys and girls from Hampshire. Simon Says is a charity that aims to Support Hampshire children and young people up to the age of 18 years who has a significant person in their life who has died or is dying.